Sometimes, you may want to copy or move subscribed contacts from one audience to another. Maybe you've exceeded your audience's group limit, for example, or use one account to manage different audiences for multiple organizations. 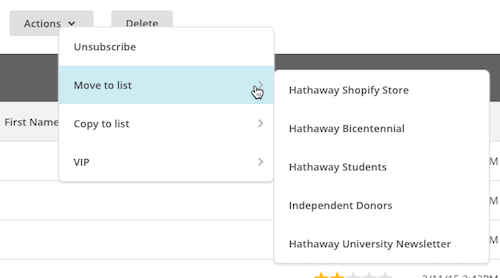 In this article, you'll learn how to copy or move subscribed contacts in your Mailchimp account. Review our audience management tips before you copy or move subscribers into another audience. For compliance reasons, we only allow you to copy or move contacts whose Email Marketing Status is Subscribed. 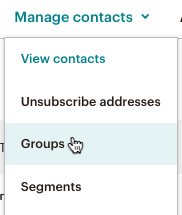 Contacts whose Email Marketing Status is Unsubscribed, Non-Subscribed, or Cleaned cannot be copied or moved to another audience. All audiences in Mailchimp are independent of each other and share no contact data. To send targeted content to a section of the same audience, use groups or segments. To retain audience field data you use to personalize campaigns, make sure the new audience contains the same audience fields. Moved contacts retain signup source data from their original audience. Signup source data describes how your contact was added to your audience. Moved contacts do not retain campaign activity data from their original audience. Campaign activity data describes how contacts have interacted with past email campaigns. Bulk actions are prohibited on an audience for seven days after it's used. Learn more about these limitations. To copy an entire audience, see Replicate an Audience. Or, to copy or move subscribers to a group in another audience, export the subscribers from the original audience and add them to the correct group when you import them back to Mailchimp. When you copy a subscriber, their email address will appear on multiple audiences. We typically discourage users from storing duplicate contacts, because it can increase your monthly billing rate. But we know that it's necessary in some cases. To copy subscribers to another audience in your account, follow these steps. Click the Current audience drop-down and choose the audience you want to copy subscribers from. If you want to work with a specific section of your audience, click Manage contacts, and choose Groups or Segments. Then choose the group or segment you want to work with. Check the box next to each subscriber you want to copy, or click the arrow above the checkboxes to Select Visible or, if available, Select All subscribers. Note: The Select All option is not available when you view a group or segment of your audience. Click the Actions drop-down menu, and choose Copy to list. Click the audience you want to copy your subscribers to. Moving a subscriber completely removes their email address from one audience and adds it to another. When you move a subscriber, you risk losing that subscriber's activity and purchase history, contact ratings, and other information. We recommend you export your audience before moving subscribers, to save a backup of their data. However, you cannot import subscriber activity or contact ratings to another audience. To move recipients to another audience in your account, follow these steps. Click the Current audience drop-down and choose the audience you want to move subscribers from. Check the box next to each subscriber you want to move, or click the arrow above the checkboxes to Select Visible or, if available, Select All subscribers. Click the Actions drop-down menu, and choose Move to list. Click the audience you want to move your subscribers to. 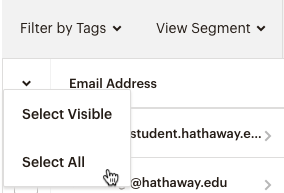 Learn how to view or export an audience or segment of Mailchimp contacts.